Ambassador K'Ehleyr comes back with a little surprise for Worf and a little surprise for Picard. Picard has to mediate the selection of a new Klingon Chancellor... and Worf has the difficult one. So the Enterprise is on a routine mission. Just checkin' out some space stuff... when along comes a Klingon ship. And upon that ship... Ambassador K'Ehleyr! You'll recognize her from the first season when she had a "thing" with Worf. But Worf wanted to get married, so she ran away. Well, now she's back and she says she has a task for Picard. Picard tells Worf to go and greet her in the transporter room, but he's reluctant. Ever since his discommendation he doesn't want to be seen by Klingons because of his dishonor. But Picard reminds him he has Starfleet responsibilities, so he swallows his pride and goes as though nothing could shake him! 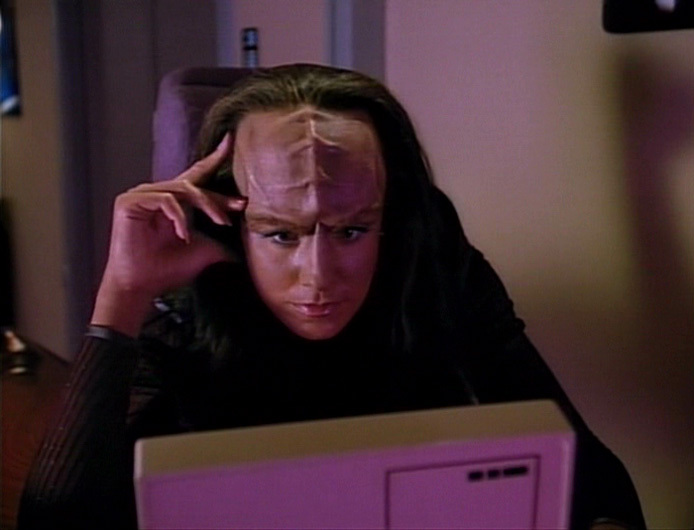 With Worf watching, K'Ehleyr beams aboard along with someone else... their son. So Worf and K'Ehleyr take Alexander, their son, to Enterprise school where he can "interact" with human children. Worf has no idea what to do about him. K'Ehleyr has to practically drag the question "is he mine" out of him. He still doesn't say it, but the answer is clear. Worf is a father. Meanwhile, K'Ehleyr explains to Picard that the Klingon Empire is nearing civil war and Chancellor K'mpec is nearing death. When Picard goes to the Klingon ship to meet with K'mpec, he finds that someone has been poisoning the chancellor. The chancellor finally dies, but not before giving Picard the task if figuring out which of the two people vying for control of the Empire was doing the poisoning. Anyone else voting for this guy? The two contenders for the position are Gowran (pictured) and our good friend Duras. If you'll remember, last season, Duras's father betrayed Khitomer to the Romulans and Duras tried to pin it on Worf's father. Because Duras's family is so powerful on Qo'nos, Worf opted to accept the blame and discommendation rather than dishonor Duras's name. When Duras and Gowran make it to the rendezvous, they're eager to start. The first part of the ceremony is to check if K'mpec is actually dead. Picard and each of the candidates do that by pressing a painstick against his lifeless chest. After that, apparently there's a bomb involved. An explosion rocks the Klingon ship, and, afterward, everyone is checked by Dr. Crusher. Apparently, the bomb was planted inside one of Duras's aid's arm. But what's even more interesting is that the bomb, according to Geordi, had all the indications of being Romulan in origin. Meanwhile, K'Ehleyr and Worf have words about whether or not to get married because of Alexander. 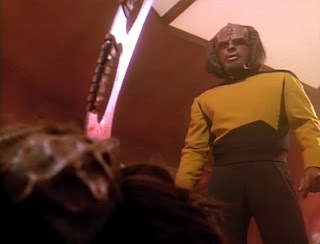 Worf is in a bind because he loves K'Ehleyr, but he doesn't want to bring his dishonor to her or Alexander by marriage. Frustrated with Worf's secrecy about the circumstances behind his discommendation, K'Ehleyr begins digging for information. With two Klingons now dead, Picard uses an old Klingon rule to stall the ceremony by having the two contenders list their achievements while Worf heads up an investigation. Picard is counting on Duras's hatred of Worf to make him slip up. And it eventually does... but first it's Gowran's turn. He goes to K'Ehleyr while she's investigating and tries to bribe her. You see, he knows that K'Ehleyr is in the captain's favor. He thinks he can convince K'Ehleyr to tell Picard that he's the right man for the job, if only he offers her the right incentives. Unfortunately for him, she doesn't care one bit about position in Klingon society. He storms out, unsatisfied. So it's Duras's turn? Well, first, let me remind you that Duras's father sided with the Romulans and now his man was caught with a Romulan bomb. It's not looking very good for him in the first place. But now, when Duras discovers that K'Ehleyr is doing some digging into the discommendation incident, he starts to shake. It's his turn to visit K'Ehleyr, and he is not going to be so benevolent. When he confronts K'Ehleyr, she reveals that she knows exactly what happened. His father betrayed the Klingon Empire and she was going to tell everyone all about it. Except she's not. Because Duras kills her. Worf later comes by with Alexander and finds her dying in her quarters. With her last breath, she confirms that it was Duras who killed her. Worf morns. He tells Alexander to look upon death. And then he goes for vengeance. With Duras dead, Gowran is left unchallenged for the Chancellor seat. 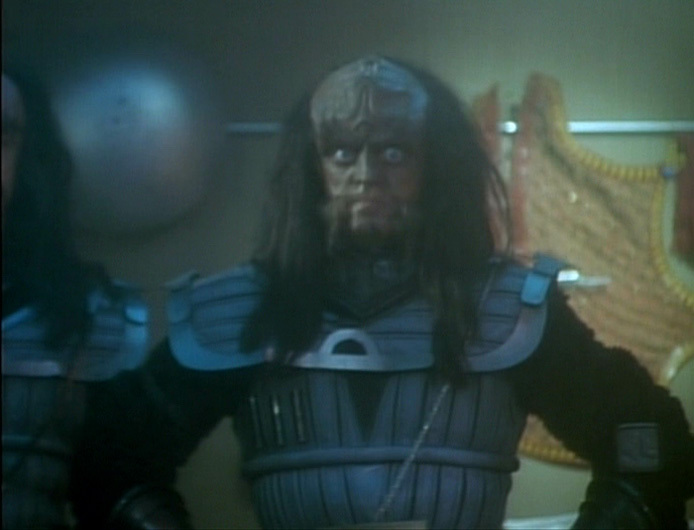 With the nature of Klingon law and tradition, Worf is free from any legal action. But with the nature of his position of Starfleet, Picard gives him a good chewing out and puts a reprimand on his record. 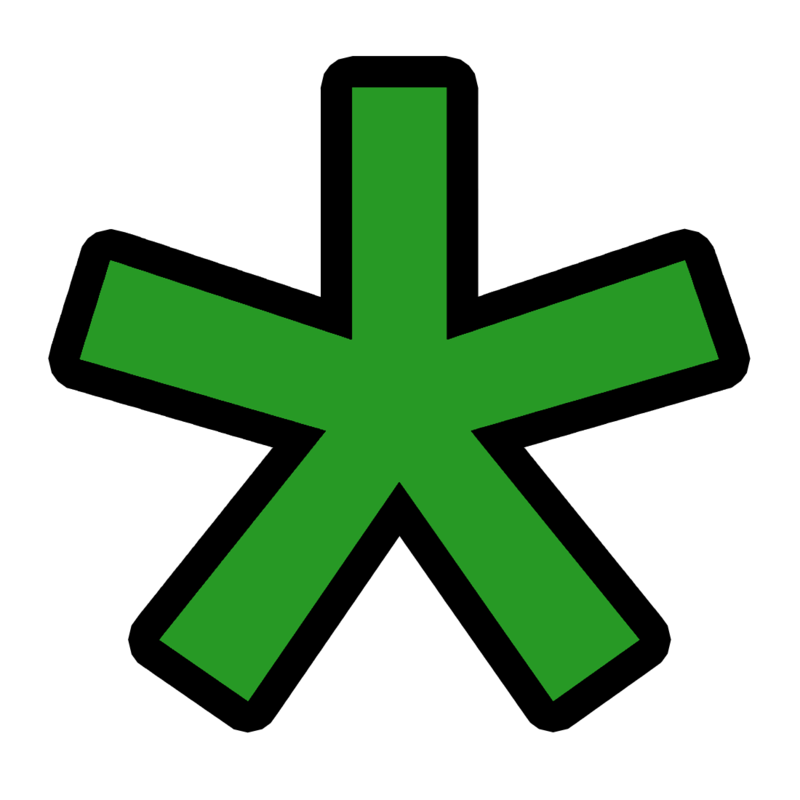 And now there's the little matter of the little Klingon. Worf informs Alexander that he will be going to live with Worf's adoptive parents. 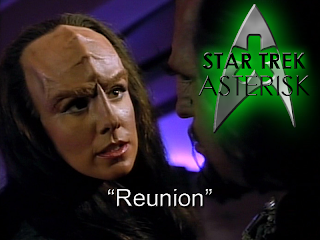 Alexander deserves a real family that can give him a real home, and that's not something that Worf can give right now. Alexander then asks him point-blank: "Are you my father?" Worf's answer is "yes." This is a pretty amazing story. Not only is it a huge leap forward for Worf's character, but it's the beginning of a Klingon storyline that won't be resolved until Deep Space Nine. It's kind of regrettable that we had to lose K'Ehleyr to get there. She was an amazing character. But at least she was avenged. And now we have Alexander to keep up with. Fun!